I was going to write that it is a long time since a book review made me cry with laughter. But on reflection I don’t think a book review has ever made me cry with laughter. 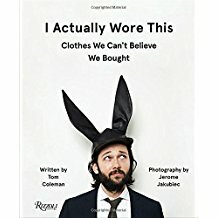 Not until I read a review of I Actually Wore This: Clothes We Can’t Believe We Bought by Tom Coleman with photographs by Jerome Jakubiec in the i newspaper a couple of weeks ago. The review was titled ‘Taste Takes a Holiday.’ Coleman wanted to put together a funny book about fashion and he has succeeded. He persuaded 80 brave souls to chose a garment that represented a disastrous lapse in judgement, explain how they came to buy it and then – genius! – to be photographed in it. I am laughing all over again at the photographs that illustrated the review. It is hard to pick a front-runner, but the yeti suit worn by Tim Convery to go clubbing is a lulu. This set me thinking about my own crimes against fashion. There have been a fair few over the years, but the garments have all been discreetly disposed of in charity shops and I was careful not to be photographed in them. 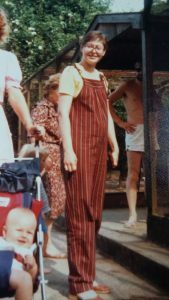 Except, yes, a rummage in a box of photographs turned up one of me wearing some very unflattering striped dungarees sometime in the 1980s. I looked like a giant toddler – or maybe a deckchair. And, oh dear, those enormous glasses. I would love to hear about the memories that make you cringe. Kipper ties? Shoulder pads? Hot pants? Bring them on . . . Attending what seems to be a routine break-in at the home of artist, Zoe Grant, Detective Garda Cathy Connolly makes a grisly discovery: an old wedding dress with a baby’s bones sewn into its hem. And then the dress’s original owner, Zoe’s grandmother, is found dead in a Dublin suburb. Cathy and her team struggle to untangle a crime that goes back generations. Meanwhile, a killer has already left two dead in the States – and now he’s in Dublin. They must find him before he kills again. 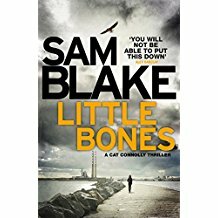 It’s a strong and intriguing opening to Sam Blake’s first novel, Little Bones, which I received as a review copy. I liked the strongly drawn female characters – especially the kick-boxing Cathy Connolly – and I don’t think it is a spoiler to say that at the beginning of the novel she is horrified to discover she is pregnant after a one-night stand with an old friend. What should she do? She’s had a Roman Catholic upbringing, this is Ireland, and abortion is illegal. But what would single parenthood do to her cherished career? There’s freshness to the setting and the characters and a warmth to the writing. The strong plot lines are skilfully woven together. I did find a coincidence late on in the novel a bit hard to swallow, but nevertheless this was a gripping and well-paced read from a promising new writer. Bodies from the Library has become an annual event. I went for the first time last year and thoroughly enjoyed it, so I was delighted to be invited to speak this year. Sarah Ward and I will be talking about ‘Forgotten Women Authors’. Sarah’s choice is Elizabeth Daly and mine is Ethel Lina White. I’ve already mentioned Ethel Lina White on the blog: here and here and I have plenty more to say about her. I love the fact that she didn’t publish her first crime novel until she was fifty-five and yet her third novel, Some Must Watch, became a Hollywood movie and her fifth, The Wheel Spins, was filmed by Hitchcock as The Lady Vanishes. She was a best-seller in her day and wrote the kind of suspense that sets your heart racing. Yet she is little-known now. If you want to know more, come along on the 17th June! It’s a great pleasure to have Margot Kinberg as my guest on the blog today. Margot’s wonderful blog, Confessions of a Mystery Novelist, is a must-read for me and many other fans of crime fiction. Her knowledge of crime fiction is encyclopaedic, she blogs every day – yes, every day! – and yet her standard never slips. I have picked up so many books for my TBR list from her and she has started some fascinating debates. She sets some killer quizzes, too! She is also the author of the Joel Williams series of crime novels. 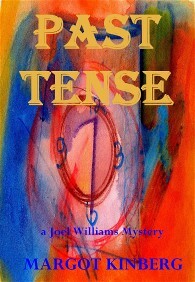 The latest, Past Tense, combines two things I especially enjoy, a campus crime and a cold case when, during the excavations for a new building, the body of a student who disappeared forty years ago is discovered. It’s a splendid read. Welcome to the blog, Margot. Thanks so much for inviting me, Christine. It’s a privilege and an honour. The honour is all mine, Margot. Let me begin by asking how you carve out time to write fiction? What’s your writing routine? I’ve found that I write best in the morning, so I try to commit some time each morning to my fiction. I must admit, there are days when I can’t. I’m in higher education, and, as you know, academia doesn’t really keep a regular schedule. But I do make an effort. And my thinking is, even twenty minutes and a few sentences is progress. I try to guard my writing time jealously, too; when I’m writing, I don’t answer email or check social media. I write. I also jot down notes if I get an idea when I’m not at home. Later, I look back on those notes when I’m actually writing. Things are a bit different when I’m not teaching. Then, I try to focus as much as I can on my writing, because my non-teaching schedule is a bit more flexible. So, that’s when I do those major revisions that require a lot of extended attention. What comes first for you, plot, characters, or theme? For me, it’s always character first. I write crime fiction, so my first stop is always the victim. I think about who that person is, and what that person is like. That leads me, then, to the people in the victim’s ‘inner circle’ – those who might have the most likely motives for murder. Then, I move to other people who know the victim. From all of these interactions and relationships, I can get a sense of what might have happened to cause the murder. And that’s where the plot comes in. The ‘how’ and ‘when’ often come once I’ve worked out who’s killed, why, and by whom. The better I get to know the characters, the better the plot works, anyway. Who are your writing heroes? Whose books do you like to read and why? I’m very fortunate that there are a lot of highly talented writers out there whose works I enjoy. It’s hard to pin down just a few, as I think I learn something from just about every author I read. But here are one or two. I’m a fan of Paddy Richardson, whose characters are so beautifully done, and whose writing style I really admire. If it’s by Paddy Richardson, I’m sure I’ll love it. She really does deserve more attention than she gets. I admire Michael Connelly, too, on a few levels, not the least of which is his consistency. He’s been writing for twenty-five years, and has remained consistently strong as an author. There are plenty of other contemporary authors, too whose work I really respect – far more than there is space here. Going back to the classics, there’s no doubt that Agatha Christie is my hero. True, some of her books are stronger than others. But overall, the body of her work is so well done, and what clever plots! I could go on, but I won’t. Let’s just say I learn something new from her every time I re-read one of her stories. Sadly, I don’t live anywhere near one of the ones I like best. It’s Baldwin’s Book Barn, located in rural southeastern Pennsylvania. It’s a converted barn – five floors filled with all kinds of books. A person could get lost for days, just browsing. I miss it very much actually. I’ve another top shop, though, in San Diego, which is about 35-40k from where I live: The Mysterious Galaxy. Its specialties are crime fiction, speculative fiction, fantasy and horror. It’s an indie shop, so it’s got its own distinctive style. I also love the fact that the owners welcome authors – even those who aren’t ‘household names. Thanks for asking. Right now, I’m revising my fourth Joel Williams novel. It’s going well, but not nearly as quickly as I’d like. As you know, revisions can take time, and one small revision in one part of a story has a ‘cascade effect’ in others. I’m optimistic, though (most of the time!). I’m also working on a standalone – quite different to the Joel Williams novels. In that way, it’s a bit like your choice to write Deep Water, which is different to your Cassandra James series. In the novel I’m working on, a fifteen-year-old homeless girl, Staci McKinney, witnesses the aftermath of a murder. The criminals catch sight of her, too. In part, the novel follows Staci as she tries to stay clear of the murderers and survive. As the novel goes on, she’s befriended by Leo Slater, a thief and fence who has his own past history. Staci decides to work with Leo, who in turn, gives her a safe place to live and some protection against the criminals who are looking for her. The novel follows the murder investigation as well as what happens in Staci’s own life. It’s a bit of a departure for me, as it’s a slightly darker novel than what I usually write. But I’m very much enjoying the process, and it’s ‘stretching’ me as a writer. And finally: how do you do it, Margot? How do you manage to post every day and keep up such a high standard? First, thank you. It means a lot to me that you enjoy what you find on the blog. I’m really glad you do. For me, crime fiction is utterly fascinating on so many levels. There’s always something new to discover, always some new perspective from which to look at the genre. And there are so many fine crime novels out there that there are always other talented authors to try. What’s not to love? Besides, keeping a blog is good writing discipline for me. And, I enjoy sharing my passion for the genre, so for me, it’s not an onerous task. It’s more along the lines of excitedly talking about a much-loved film or book with a group of friends. And that’s the other thing that keeps me blogging: the wonderful group of readers and writers, such as yourself, who share an interest in crime fiction. I learn so much from everyone! The comments I get on my blog are so informative, and I treasure the online friendships I’ve made. It has been a pleasure, Margot. Good luck with your writing and I look forward to visiting you many more times at Confessions of a Mystery Novelist.